In order to maintain the microflora in the gut, the immune system must be taught to tolerate foreign bacteria. LMU researches have now shown how immune surveillance cells are educated to perform this task. The fundamental task of the immune system is discrimination -- discrimination between the tissues of its host (‘self’) and invasive pathogens (‘non-self’). In order to turn its destructive powers on the proper targets, it must be capable of distinguishing friend from foe. This poses a particular challenge for the immune cells that are associated with the epithelial lining of the gut. They are exposed to the natural microbiota of the gut, which themselves play an important physiological role. Hence the immune system must in some way be actively prevented from attacking these bacteria although they do not fall into the ‘self’ category. A German-Italian research collaboration has now uncovered one mechanism that helps to maintain this equilibrium in the gut. The project was led by Professor Thomas Brocker, Director of the Institute for Immunology at LMU, and the researchers report their findings in Nature Communications, an open-access member of the Nature family of science journals. So-called dendritic cells (DCs) play a key part in maintaining this vital balance. DCs have two quite distinct physiological roles: In cases of infection they are essential for the activation of an immune response, but they are also involved in promoting immunological tolerance, i.e. they are capable of actively suppressing the immune response. In this sense, DCs act both as warriors and as diplomats. In the latter guise they stimulate what are called induced regulatory T-cells (iTregs), which control the development of immunological tolerance and inhibit the activation of the immune system. 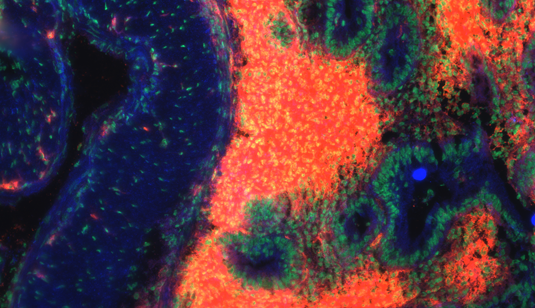 In order to trigger tolerance vis-à-vis the gut microflora, DCs in the gut epithelium recognize and internalize microbial proteins and migrate to the lymph nodes that are associated with the intestine. On the way, the bacterial proteins are processed into small fragments. These tags are then displayed on the surface of the DCs in association with specific binding proteins that are recognized by regulatory T-cells. This interaction in turn instructs the iTregs to suppress immune responses against the proteins in which these segments occur. “We believe that these iTregs are specific for the proteins produced by natural gut bacteria,” says Brocker. Dendritic cells, in particular those that bear a protein known as CD103+ on their surfaces, migrate to lymph nodes from the gut epithelium, and keep the immune system up to date on the composition of the gut microflora. But the researchers wanted to know how the tolerance edict is ‘revoked’ in an emergency. They went on to identify a well-known signaling molecule, CD40, as the alarm button. CD40 is a second surface receptor on the DCs. But the interaction of CD40 with its binding partner on so-called effector T-cells turns previously diplomatic DCs into warlike DCs by priming them to trigger rather than inhibit immune responses. The researchers demonstrated the effects of this transition in an animal model. Mice in which the CD40 signaling relay was permanently activated developed severe colitis, but showed no other symptoms. These dendritic cells can still migrate from the gut epithelium to the lymph nodes. However, once there, they undergo programmed cell death (apoptosis) and therefore cannot alert the regulatory T-cells to ensure the maintenance of immunological tolerance of proteins derived from the gut microflora. As a result, a generalized immune response is activated, and T-lymphocytes migrate to the gut epithelium where they induce inflammation. If these mice are then treated with antibiotics that eliminate the natural microbiota from the intestine, the inflammation subsides and the mice survive. “These findings show that interaction between CD103-positive dendritic cells and regulatory T-cells is essential for the maintenance of the correct immunological equilibrium or homeostasis in the gut,” Brocker concludes. He and his colleagues now plan to clarify whether properly programmed regulatory T-cells are in fact specific for members of the gut microbiota, as the present results suggest.